Is Winterfest Brooklyn’s version of Fyre Festival? The hosts of Winterfest will likely be receiving coal in their stockings this year. What was advertised as a 40,000-square-foot “world of holiday joy and wonder” behind the Brooklyn Museum has turned out to be anything but merry, according to peeved patrons and vendors, who likened the failed holiday attraction to a scam. Melanie Montalto of Fort Greene is the latest customer to voice her concerns, telling the Brooklyn Eagle that the organizers of the event have repeatedly ignored her refund requests. Winterfest, which opened on Nov. 23 and is scheduled to run through Dec. 31, promised shopping, entertainment, a Santaland, a slide, a large menorah, a giant snow globe and a tree maze. Customers complained that the event, organized by Millennial Entertainment Group, did not contain either the promised slide or snow globe, and the “Chocolate Experience” was merely a tent serving instant hot cocoa and candy. Winterfest initially sold $20 tickets simply to enter the grounds, but the event is now free, causing customers like Montalto to demand reimbursement. “We are extremely disappointed that the organizers have failed to live up to their promises, and we have conveyed our concerns to them,” the statement reads. Despite the museum’s response, customers like Montalto have had their refund requests fall on deaf ears. Jennifer Crosby, a Winterfest employee, told Montalto that her ticket would now include a chocolate plate, a glass of wine, a picture with Santa and a scavenger hunt with a gift. Montalto responded that she did not have children and would prefer a $40 refund for her two tickets instead of those concessions. But that was the last time Montalto heard from Crosby, who ignored three subsequent emails on Dec. 7, 10 and 12, all of which have been reviewed by the Eagle. Oren Yaniv, senior communications officer at the Brooklyn District Attorney’s office, confirmed that the Frauds Bureau is “reviewing [a] complaint” against Winterfest. 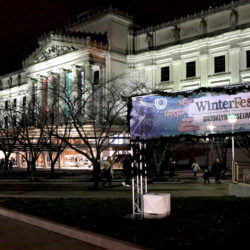 UPDATE: “Winterfest was intended to bring for the first time a holiday market and festive destination for Brooklyn and raise funding for the Brooklyn Museum and Botanic Garden, as well as other local charities,” Crosby told the Eagle.